This week I was busy making paintings and I was successful to make some. I am doing painting on purpose, hoping to do charitable donations of around NRs. 10,000 and therefore, I am being able to paint much more frequently. This has definitely increased my motivation and taught me a lesson that we should set a goal before doing anything, in order to be more effective. 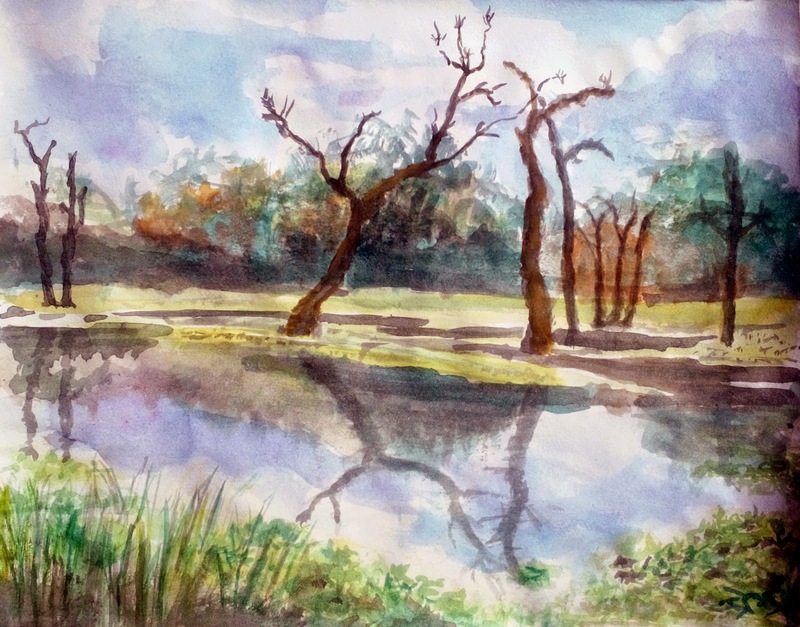 I am hoping to do even more paintings in the days to come. Right now, I am going to share what I have been able the paint for the past couple of weeks. 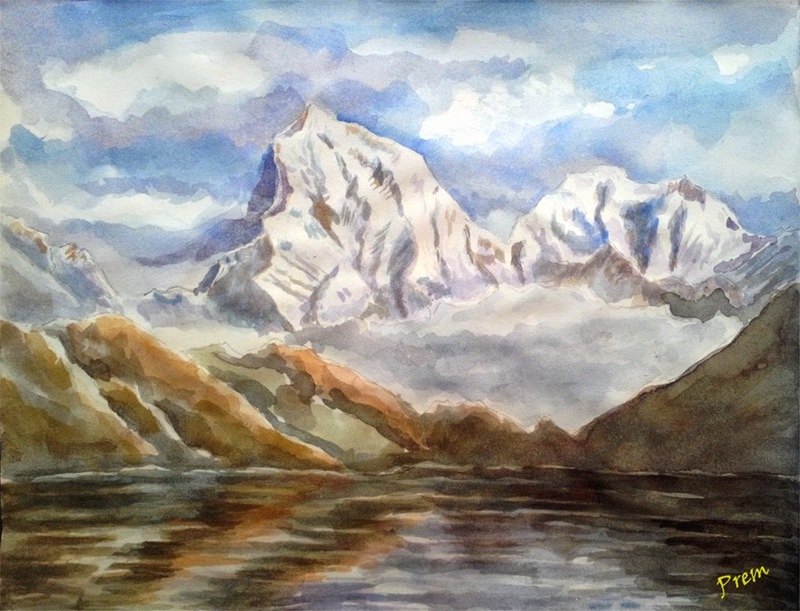 The first three paintings are the paintings of mountains. The first two were attempted simultaneously, however, the second one was completed on one sitting, whereas, the first one was given a final touch the next day. The brush work is quite important in mountains especially to carve the ridges, bulges and protruding parts of the mountains. 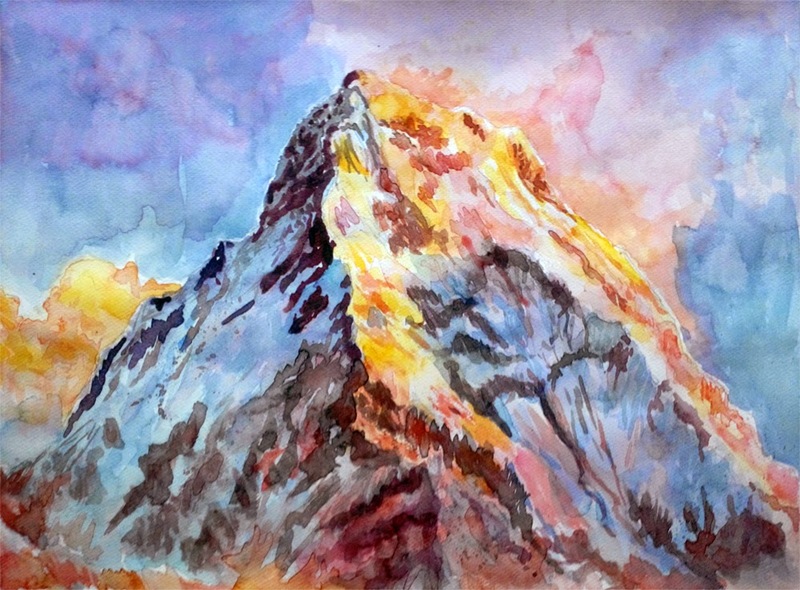 This mountain painting was completed on one sitting and I had to do some lifting work with the sky because of the opacity of the colors. Sky on this painting was made out of imagination in order to break the monotonous color and it almost became problematic. This painting and the subsequent two paintings, were made on a simple chart paper (quite a thin paper) compared to the paper used for the rest of the paintings (the first two and the last one). However, this paper was much more effective and absorbent. Moreover, the texture of this paper was smoother and thus, it was easier to spread the color. 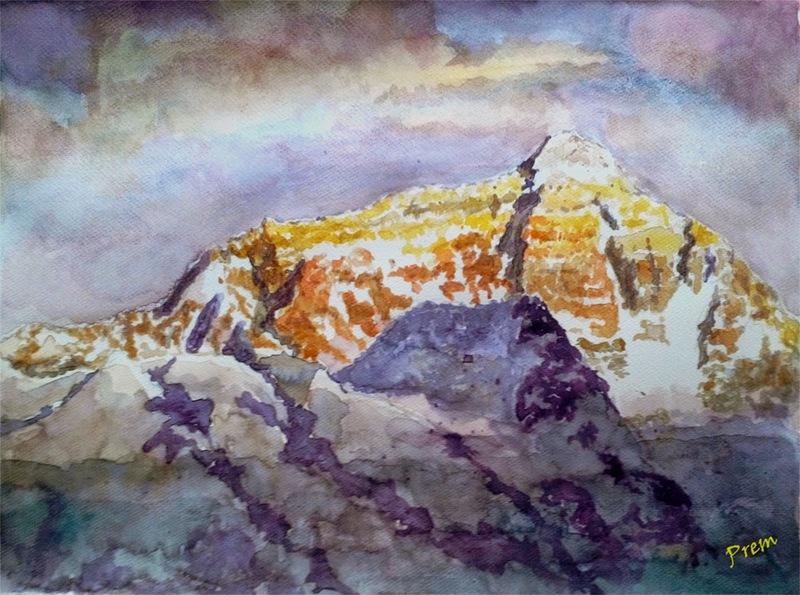 The third mountain above is one fine painting which I completed in almost two hours from a reference photograph. It is one of the mountains of Nepal but I'm a bit unsure about its name. 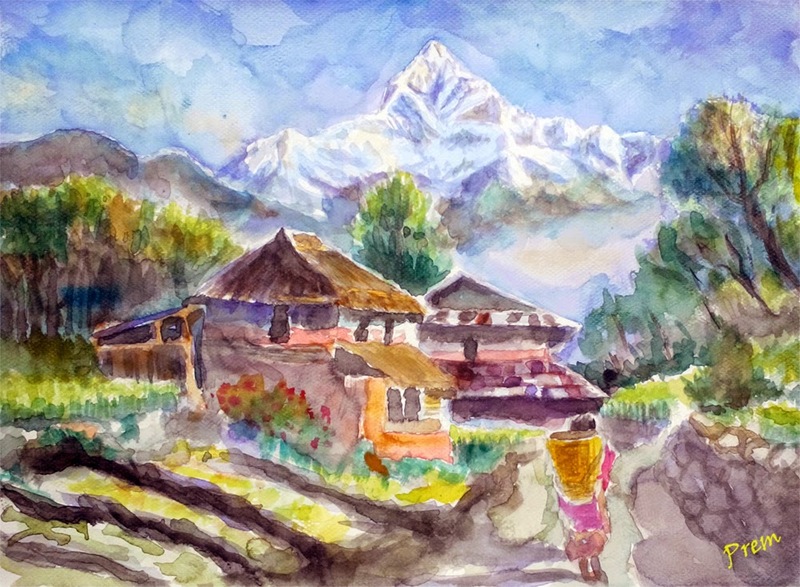 This art is the scene of Rhino Taal, a sight of the day, It was quite simple and easy watercolor work. I directly started painting this piece, without sketching and it was not bad. The painting was completed in almost about a hour and a half, which made me quite happy as I that showed an improvement in my efficiency. I was doing painting on a purpose and I wanted to be faster and more productive. I succeeded to some extent. This painting is of Buddhist Stupa which was old and redundant. 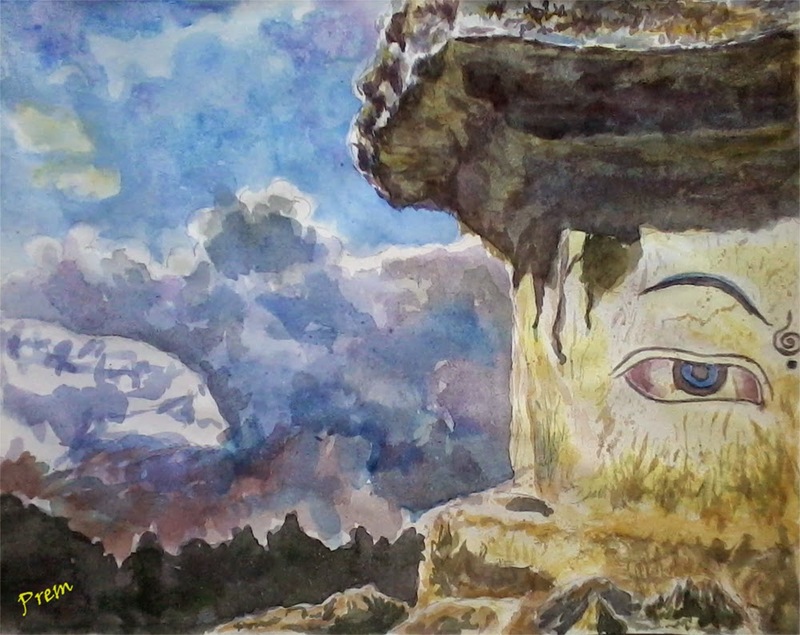 I referenced this as well from the photograph and I especially enjoyed creating the details of the foreground Stupa. The background was a bit hassle, and it became problematic when I worked in rush and applied too much color. I was too impatient to wait for the previous layer to dry. This painting is a disaster turned okay, and Therefore, I am here to share it with you. The houses have been totally a mesh but when looked from a distance they seem to be identifiable. That's why I could share it. The original version is more vibrant and full of colors and looks almost good when looked from a distance. I hope this will sell too when I later organize an exhibition for charity. Your comments and specific suggestions so as how I can improve my paintings are welcome.